Do Curcumin Supplements Increase Risk For Heart Attack And Stroke Like NSAIDs Do? Patients who have cardiovascular disease and are taking NSAIDs, especially cyclooxygenase-2 (COX-2) selective agents, are at a much higher risk of having an MI [heart attack] than patients not taking these drugs. A nationwide cohort study of patients with a first-time MI demonstrated that short-term and long-term use of NSAIDs and COX-2 inhibitors increased the risk of death or recurrent MI. Overall, the evidence suggests advising caution against both short-term and long-term use of NSAIDs and selective COX-2 inhibitors in patients with high risk of cardiovascular disease. Rofecoxib, a COX-2 inhibitor, has been associated with coronary and cardiovascular death, even in small doses. During treatment with NSAIDs, patients should be closely monitored for increases in blood pressure, signs of edema, decreasing renal function, and GI bleeding. … It should be noted that all NSAIDs, including COX-2 inhibitors, can raise blood pressure. Even over-the-counter NSAIDS such as Advil, Motrin, and Aleve come with these risks, which, by FDA requirements, are labeled on the package. When people suffer GI distress while taking an NSAID, a proton-pump inhibitor, like Nexium, can be prescribed. When their blood pressure goes up, ACE inhibitors and diuretics can be prescribed. The diuretics might also handle the NSAID-induced edema. This is how polypharmacy happens. It began with pain, pain that has been shown to be relieved with non-drug therapies like a change in diet, range-of-motion exercises, topical capsaicin (hot pepper), and relaxation techniques. If curcumin does indeed relieve pain by inhibiting Cox-2, then, it seems to me, people who take curcumin supplements would also be at higher risk for heart attack and stroke, as well as bleeding and blood pressure problems, especially if they are older and have comorbidities. 2 Specific inhibition of cyclooxygenase-2 (COX-2) expression by dietary curcumin in HT-29 human colon cancer cells, Cancer Letters, 2001. This entry was posted in Uncategorized on November 12, 2015 by Bix. 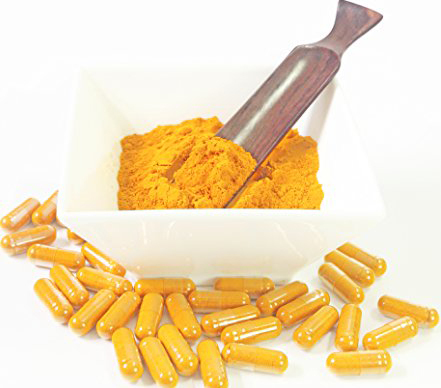 Unlike other COX-2 inhibitors, such as Celebrex, curcumin is nontoxic and produces no serious side effects. “Nontoxic.” What does that mean?